We consider the immune system as our friend; it protects us by fighting infections while keeping us healthy. But there is a darker side to the immune system. Often, when it comes to cancer, we find that the immune system can turn traitor and actually promote cancer development. The presence of white blood cells in tumors has been noted for many decades and provides the first clue that inflammation is linked to cancer. Yet it is only within the last few years that we have obtained clear evidence that inflammation plays a critical role in cancer development, and we are just beginning to understand the molecular mechanisms of how this happens. Indeed, chronic infections, obesity, smoking, alcohol consumption, environmental pollutants and high fat diets are now recognized as major risk factors for most common types of cancer; and, importantly, all these risk factors are linked to cancer through inflammation. So what exactly is inflammation? It is how tissues and cells respond to injury. We are all familiar with the symptoms of acute inflammation: pain, heat, swelling and redness. The acute inflammatory response is normally localized and is protective. However, if the inflammation-causing agent persists for a prolonged period of time, the body’s response to it becomes a chronic inflammation. This can happen because of infection, environmental pollutants, persistent activation of inflammatory proteins, or autoimmune reactions. Most importantly, chronic inflammation increases cancer risk. A slow smoldering fire in this case does far more damage than a flash fire. What happens at the cellular level during inflammation? It is an extremely complex cascade of signaling molecules and cells that work together at the site of injury. Various cell types send out signaling molecules to attract different types of white blood cells. Of these, neutrophils are usually the first responders, and these cells kill microbes by engulfing them and releasing chemicals collectively known as reactive oxygen species. ROS kill pathogens and nearby healthy cells alike—they are messy. If an inflammation persists and becomes chronic, there is a shift in the type of white blood cell found nearby, the primary type being macrophages. Chronic inflammation causes tissue damage and often results in the repair of this damaged tissue by replacement with fibrous connective tissue. An extremely graphic yet apt way of describing a tumor is as “a wound that doesn’t heal.” Indeed, there are many similarities between a cancerous tumor and the process of wound healing. Both involve the growth, survival and migration of cells; both require the growth of new blood vessels. Importantly, all these processes are controlled by growth factors and signaling molecules. Just as the immune cells gather near a site of injury to secrete growth factors to begin tissue repair, tumors can also surround themselves with immune cells that secrete these same growth factors to promote their uncontrolled cell growth. What orchestrates the inflammatory response? 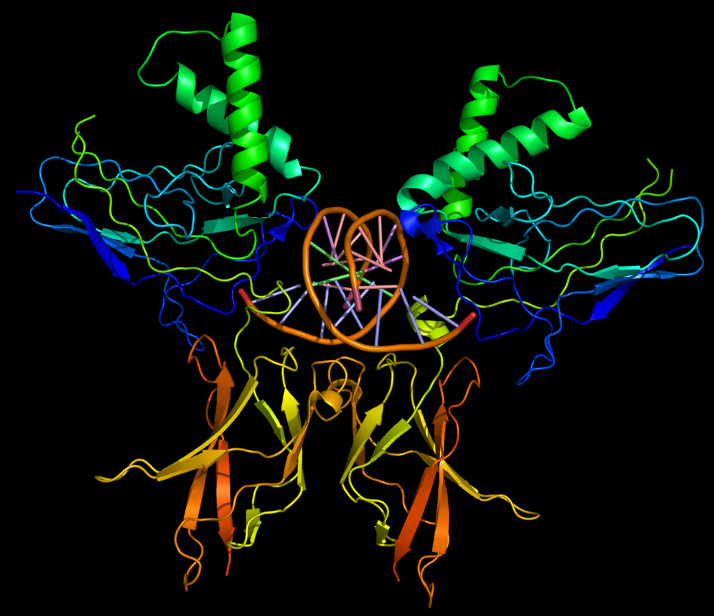 A protein known as NFκB (pronounced NF-kappa-B) has been described as “playing the first violin, if it is not the conductor of the inflammatory response.” Since NFκB is such an important first responder to inflammation it is already present in cells in an inactive state and does not require any protein synthesis to become activated. NFκB is held in an inactive state by a protein known as IκBα, which binds to NFκB and prevents it from moving into the nucleus of the cell. IκBα essentially behaves like a goalkeeper. So to activate the NFκB pathway, the goalkeeper must be neutralized. 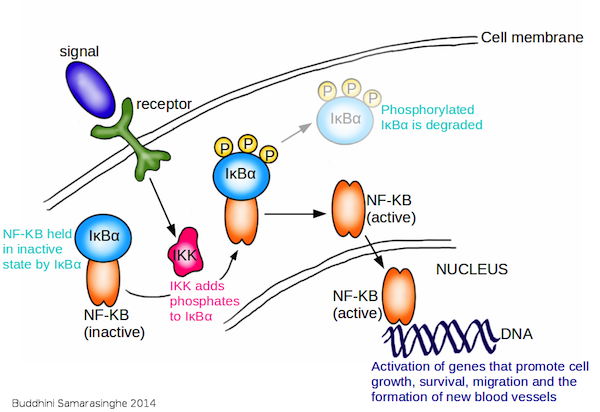 This is the role of an enzyme known as IKK (IκB kinase). Remember, kinases are enzymes that add phosphate groups to proteins. By adding a phosphate group to IκBα the goalkeeper, IKK ‘tags’ it for degradation; the goalkeeper is neutralized. NFκB is now free to move into the nucleus of the cell and activate a wide range of genes that promote cell growth, survival, migration and the formation of new blood vessels. In the context of cancer, the activation of NFκB in immune cells induces the production of molecules that activate NFκB in cancer cells; these in turn induce molecules that attract more immune cells into the tumor. It is a feed-forward loop that results in a frenzy of uncontrolled growth, with the immune cells actively enhancing the Hallmark capabilities of the cancer cells. Although various types of immune cells are involved in this process, with respect to supporting tumors, the main culprits are known as Tumor Associated Macrophages (TAMs). Patients with tumors that have been infiltrated by TAMs have a much poorer prognosis than those that do not. These TAMs are found in most malignant tumors, and in some instances can comprise up to 50 percent of the cell tumor mass. TAMs can support a growing tumor by assisting the cancer cells to bypass some of the anti-cancer defense mechanisms that are represented by the Hallmarks. There are four main mechanisms by which TAMs help a tumor develop and grow. First, a tumor is addicted to a constant supply of growth factors, which it uses to drive its unchecked growth as described in Hallmark 1. Although the tumor cells themselves often carry mutations that allow them independence from this limitation, TAMs also provide the necessary growth factors. TAMs have been shown to produce growth factors such as Epidermal Growth Factor (EGF), Fibroblast Growth Factor (FGF), and other small molecules known as cytokines, primarily IL-6 and TNF. Second, as described in Hallmark 5, a growing tumor needs to establish a blood supply through a process known as angiogenesis. Angiogenesis is primarily regulated through the angiogenic growth factor Vascular Endothelial Growth Factor (VEGF) and Platelet Derived Growth Factor (PDGF). TAMs have been shown to secrete both VEGF and PDGF into the tumor microenvironment in order to promote angiogenesis. The uneven distribution of blood vessels and regions of oxygen starvation (termed hypoxia) are characteristics of advanced tumors, and TAMs often preferentially accumulate in these regions, activating angiogenesis through the hypoxia response pathway as described in Hallmark 5. Intriguingly, VEGF has also been shown to attract TAMs to a tumor, demonstrating yet another feed-forward loop where TAMs surrounding a tumor secrete VEGF which in turn attracts more TAMs to that tumor. Third, as described in Hallmark 6, the spread of cancer cells from the site of the primary tumor into distant metastases requires the degradation of the Extra Cellular Matrix (ECM). This is aided by enzymes known as matrix-degrading enzymes, notably matrix metalloproteases and again TAMs have been shown to secrete these enzymes to aid the invasion and spread of cancer cells to distant sites within the body. Finally, TAMs can suppress the adaptive immune system, so that any cancer-killing activity of the immune system is effectively neutralized. TAMs do this by producing immunosuppressive molecules, thus allowing the tumor to evade the immune system. TAMs can also release cytokines that preferentially attract other immune cells that have no cell-killing activity. It is the equivalent of recruiting law enforcement officers carrying toy pistols—the tumor is unaffected and indeed thrives thanks to being unimpeded by the tumor-killing aspects of the immune system. This process will be discussed later in Hallmark 10. Tumor associated macrophages (TAMs) support tumors through four different mechanisms. / Image by Buddhini Samarasinghe. How are ordinary macrophages recruited and corrupted to become TAMs? Intriguingly, a developing tumor does not recruit existing macrophages into becoming TAMs. Instead, tumor cells produce many small molecules known as chemokines and cytokines during the early development of the tumor. These molecules ‘convert’ precursor macrophages (known as monocytes) into TAMs. As the tumor progresses, areas of low oxygen develop; this results in the activation of the hypoxia response pathway (described in Hallmark 5) which liberates VEGF and other factors and also includes the activation of NFκB. This in turn attracts even more TAMs to areas of low oxygen. Tumors and their TAMs. Tumors secrete signalling molecules known as chemokines to attract circulating monocytes, a type of white blood cell. Once in the tumor, the monocytes differentiate into Tumor Associated Macrophages (TAMs). Oxygen-starved (hypoxic) areas of the tumor secrete VEGF, which attracts these TAMs. TAMs can also secrete VEGF, which in turn attract more TAMs to the tumor. 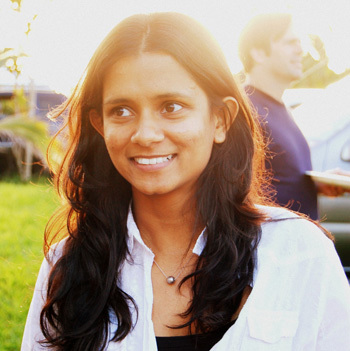 / Image by Buddhini Samarasinghe. It seems counterintuitive to consider the existence of both tumor-promoting and tumor-killing immune cells. Upon considering the complex and diverse roles of the immune system it is easier to understand. The immune system specifically detects and targets infections through the adaptive immune system (the specific branch utilized by vaccines) which is supported by cells of the innate immune system (the non-specific branch). In turn, the innate immune system is involved in wound healing and clearing up dead cells. Specialized immune cells are responsible for each of these varied functions. The immune cells specializing in wound cleaning and clearing up dead cells are recruited and subverted by tumor cells to support tumor growth and progression. 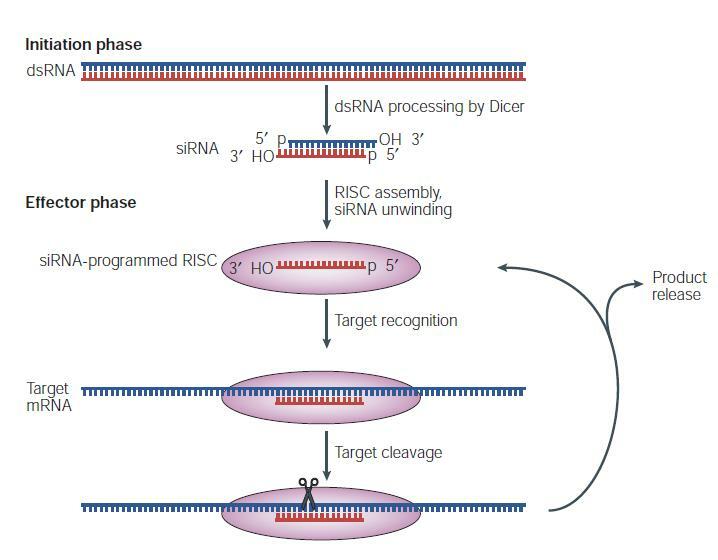 Shifting the balance from tumor promoting to tumor killing immune involvement therefore represents an attractive and powerful possibility for future therapy.